BUENOS AIRES, Argentina (CNS) — Paula Zanarini has not worked for two years. She blames her age, 38, for an inability to find or keep the jobs she had as a customer service representative for several telecom companies in Argentina. Three months into her last job, she was told, “‘We don’t need you anymore.’ They take a younger person instead,” she said. However, Zanarini put her problems aside for Carnival, donning thick makeup and a red, black and yellow suit with bead patches as she and a neighborhood troupe danced in street celebrations organized across the Argentine capital. “Even though we don’t have any cash, we party and we forget our problems,” she said prior to performing in the middle class Villa Crespo neighborhood. Carnival culminated March 4 as a sort of last hurrah of hedonism prior to Ash Wednesday and Lent. But this year, it came for Argentines as the country careens toward crisis. The country’s periods of economic expansion have been followed by crashes and currency devaluations. The Argentine peso already was devalued by more than 10 percent in January, and inflation continued climbing — topping 25 percent, according to independent estimates — although government supporters and critics clash on the impact of rising prices. A black market for U.S. dollars does a brisk business as Argentines prefer saving their money in foreign currencies that stay somewhat more stable. The unofficial exchange rate averages about 35 percent more than the one set by the government. “Our money doesn’t work for anything,” said designer Ruben Medina, who came with his family to participate in Carnival. Critics of the current administration of President Cristina Fernandez de Kirchner accuse her of applying ineffective price controls, denying the impact of inflation and employing other forms of populism such as plying people with subsidies. Supporters of the president say wages have kept up with inflation, while the Fernandez administration has made the poor a priority, along with those, such as students, needing assistance. “It’s motivation to study. If you don’t study you don’t get the (subsidy) money,” said Diego Fernandez, a political science student, who celebrated Carnival after watching the president’s annual three-hour speech to Congress in a public plaza. Pope Francis, during his time as archbishop of Buenos Aires, often clashed with the president and her late husband, former President Nestor Kirchner, over their populist practices. But the president and her supporters now claim the pontiff as one of their own — such is the pope’s popularity in his home country. Some churchmen express misgivings about the president and her decision in 2010 to make Carnival, which is popular mostly with the middle and working classes, a four-day holiday weekend. “This is populism,” said Father Joaquin Arrieta, a priest at Our Lady of Loreto Parish in the upscale Palermo neighborhood, where the residents are less likely to celebrate Carnival. “It’s bread and circuses,” he said of the Carnival holiday, which he alleged was an attempt at winning support from people happy to have another extra-long weekend, while doing nothing to improve the country’s economic or social situation. Others in the church see an attempt at reviving a lost tradition, which flourished until the 1950s in Argentina and was stamped out by the military dictatorship of the 1970s. 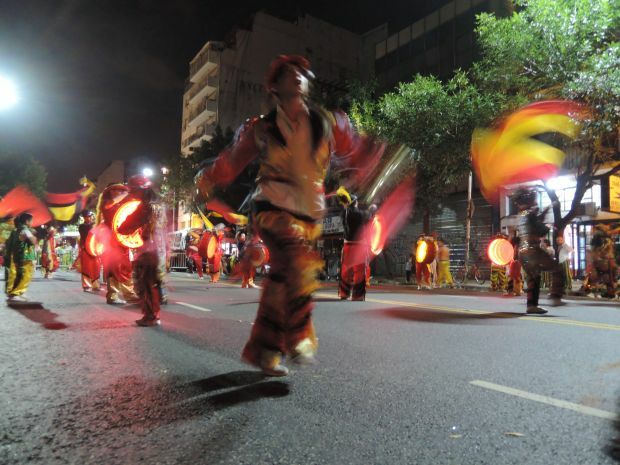 “It used to be big in Buenos Aires, but it’s recuperating some of its spirit,” said Father Jose Maria di Paola, who ministers in the city’s shanties, where some priests organize groups of young people to dance in Carnival parades. Carnival in Buenos Aires is less bawdy than in Brazil, except for some regions on Argentina’s border with its neighbor. Participants include families with children and young couples, who wear more modest outfits, usually suits with images of items and people they like, ranging from Quilmes Beer to Homer Simpson to Osama bin Laden. Groups form in neighborhoods and rehearse all year. They dance on a closed-off city block, blowing whistles and showing moves such as slaves breaking chains. Songs accompany the performances, often acerbic and political in nature. One song this year criticized blackouts in Buenos Aires over their summer.